I specialize in newborn, family, and child photography. I'd love the opportunity to take your family's portraits, and make memories that will last a lifetime. Whether it's a new baby, a 1st birthday, family portrait, or just because... I'd love to talk with you and plan our next session. Additional products and digital images are available for purchase after an above package is chosen. Sessions are for children only. No family portraits will be taken on this day. Children will have cookies with Santa, share their Christmas lists, find their names on Santa's List, and read stories with Santa. Sessions will be 15-20 minutes each, and a total of 8-10 images will be edited for your viewing. You will come into my studio 1-2 weeks after your session date to have a viewing and ordering session... it is at this session that you will choose the images and prints you'd like. 50% of the package amount must be paid upon booking to secure your time slot. I cannot wait to share this magic with you and your children! 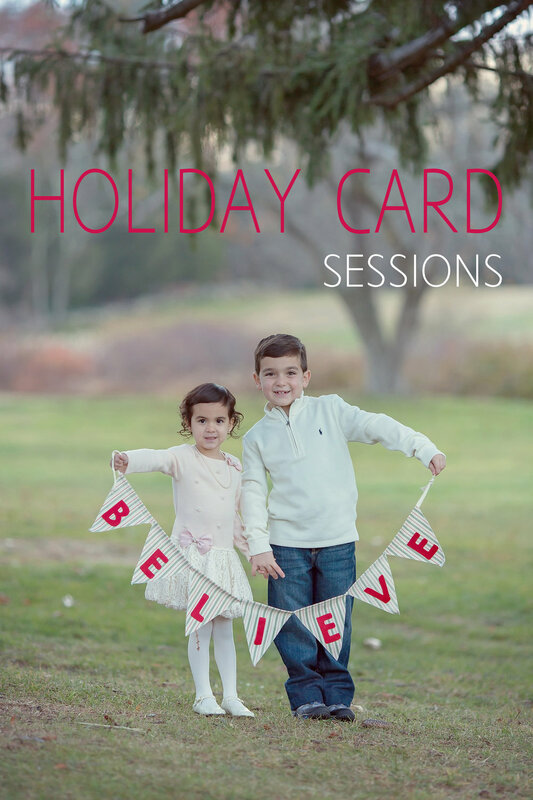 Now Booking Holiday Card Sessions! and STRESS-FREE... just the way the holidays should be. Click HERE to book your session today! Additional products and digital images are available for purchase after an above package is paid for. This offer is for my Connecticut clients AND my Pennsylvania clients! These sessions will take place on Saturday, November 18th 2017. They are for families or children only, a perfect way to update those family portraits! Sessions will be 15-20 minutes each, and a total of 8-10 images will be edited for your viewing. You will come into my studio 1-2 weeks after your session date to have a viewing and ordering session... it is at this session that you will choose the images and design your Holiday Card. 50% of package amount must be paid upon booking to secure your time slot. Sweet Luke came to visit me and oh my goodness was he a cutie! He reminded me so much of my own son, who's name is also Luke. Baby Luke weighed the exact weight that my own Luke weighed too, so it was very sweet! They were both a healthy 6lbs 1oz. How fun! I always love meeting new babies, and their families. Luke's mommy is the sweetest person! He is one lucky little boy to have such a loving family. Luke came to visit me in my studio in Guilford, CT. He was a part of my Petite Newborn Session option, where it's a shorter version of a full newborn session. The same care and precision is put into your session, except with less poses and less time. So you are presented with a smaller amount of quality images so you are still able to send out those adorable birth announcements to family and friends, while still maintaining your budget. More information on our Petite Newborn Sessions can be found here. Are you expecting a new little one? Don't wait to schedule your newborn session with Ashley Grace Photography! Our schedule fills very quickly, and it's never to early to schedule. I'd love to capture these amazing new moments for you! Sweet, sweet Ruth came to visit me and oh my goodness I was in love! She was just so adorable, and a rockstar sleeper. She let me do so much with her! I could have played with her all day. Her mommy, daddy and big brother also came to visit me, and what an amazing family they are! I'm so lucky to be able to meet such nice people. I truly have the best job in the world, and adore photographing new little ones! There is nothing more important to me than capturing the bonds between families, and being there for their big milestones, and everything in between. The birth of a new baby is such a momentous occasion, and it's filled with such love and emotion. I do not take that task lightly. It is so humbling to me to be able to provide these memories! Back to Ruth though. Can we talk about her adorable beauty mark? I couldn't handle it the whole session! As if she wasn't cute enough!! And her big brother had me completely smitten. Are you expecting a new little baby and would like to capture those first few weeks? Contact me! I'd love to meet you! Family and sibling portraits are always included for newborn sessions! These sessions will take place on Saturday, November 19th 2016. They are for families or children only, a perfect way to update those family portraits! Sessions will be 15-20 minutes each, and a total of 8-10 images will be edited for your viewing. You will come into my studio 1-2 weeks after your session date to have a viewing and ordering session... it is at this session that you will choose the images and design your Holiday Card. I had the honor of meeting this sweet baby boy at his newborn session 6 months ago. I thought he was adorable then, but oh my goodness! He just gets cuter every day!! Milestone sessions are some of my favorite sessions. I love seeing their personality blossom and capture how much they've grown in just a short time. I cannot wait to photograph this little cutie at his 1 year session! Aiden is seriously such an adorable little guy. If you have a little one celebrating an important milestone, contact me! Join our AG Baby Plan and capture your baby at 6 months (sitting), 1 year (bubble bath and cake smash) and a family session at 18 months. Whether you expecting a new baby, celebrating a major milestone, or wanting to update those family portraits, I'd love to speak with you! Sweet Charlie came to celebrate his 1st birthday with me! He was such an amazing little guy. So smiley, and so full of personality. He had such a sense of humor on him! So serious at times, then burst into laughing! I had so much fun with him. He came in for a cake smash, then we did some bubble bath fun! He had a ball! If you have a little one about to celebrate a major milestone, or maybe you just want to update your family portraits, please contact me! I'd love to meet you! Sweet, precious Alexia came to visit me in my studio in Guilford, Connecticut to celebrate her 1st birthday! She was the sweetest little thing. She reminded me so much of my daughter at her age. She was shy, and timid, but had such a personality on her! Alexia is a Daddy's girl for sure. Her poor Daddy had to dance and make silly faces for her to get her to smile. It was adorable what he would do to make his baby girl happy. Alexia wasn't too sure about the cake smash part of our session, but she love love loved the bubble bath part of it! She could have stayed in that tub all afternoon. She splashed, giggled, and laughed the whole time. And she sure loved those rubber duckies! 1st birthday cake smash and bubble bath sessions are some of my favorite sessions ever! These little people have such personality and are just a joy to photograph. If you have an important milestone coming up in your family, contact me! Whether it be a new birth, a first birthday or to update your family portraits. I'd love to meet you! Are you expecting in 2016? Book a newborn session by July 1, 2016 and receive a maternity mini session FREE and a complimentary 8x10 of your choice. Now is the perfect time to book your session! It can be for any time in 2016, you just need to pay your $95 retainer before July 1, 2016 to take advantage of this promotion! Newborns are best photographed within the first ten days of birth and my schedule fills quickly, so please contact me today to book a session!